Diogo graduated from University of York in 2004 with an honors degree in Economics & Finance. He then went on to Université Paris 1 (Sorbonne 1) to do a Diplôme Universitaire in Mathematical Models in Economics and Finance, graduating in 2005. 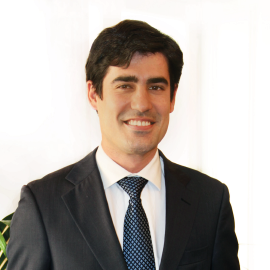 In the Banking industry, Diogo has worked as an Equity Analyst and Research Analyst for Barclays Wealth. As an Equity Analyst he followed Oil & Gas, Retail, Telecoms and Utilities. As a Research Analyst he was focused on macroeconomic analysis and strategy for Emerging Markets, mainly Brazil and India. He also worked with optimization (Black-Litterman approach) of tailored portfolios. More recently Diogo worked as external Financial Advisor for Best Bank. In the non-banking industry, Diogo has experience as Finance Director of a football club (Clube Desportivo Nacional) and Managing Director of Redecor Madeira (subsidiary of Redecor S.A. – niche markets in civil construction).